For over half a century, trimethoprim has been used as an antibacterial treatment for urinary tract infections (UTIs). Today, indications for trimethoprim have extended – a drug now also used to treat conditions such as pneumocystis pneumonia. Trimethoprim has a notable side effect and drug interaction profile; a drug that warrants a thorough and complete review. Before we review those profiles, let’s first talk about what trimethoprim is used to treat and how the drug works to treat those conditions. Urinary tract infections – trimethoprim is predominantly used for this purpose. It is a first-line treatment option for uncomplicated UTIs. Other drugs often used in its place include nitrofurantoin and amoxicillin. Pneumocystis pneumonia – patients with compromised immune systems, such as patients with HIV, are liable to experience this infection. Trimethoprim is available with sulfamethoxazole (as Co-trimoxazole) to treat this condition. Trimethoprim is most active against aerobic bacterial organisms. It is generally ineffective at treating anaerobic infections, such as infections caused by Clostridium difficile. With this in mind, let’s turn our attention to how trimethoprim works; how it exerts its therapeutic impact. Put simply, trimethoprim works by disrupting folate synthesis. Because the drug reduces proliferation of bacteria, it is bacteriostatic not bactericidal. However, trimethoprim does have a broad-spectrum of effect – with activity against both Gram-positive and Gram-negative organisms. More specifically, trimethoprim binds to dihydrofolate reductase; a process that blocks reduction of dihydrofolic acid (DHF) to tetrahydrofolic acid (THF). Disrupting THF synthesis is important – THF plays a central role in the thymidine synthesis pathway and its thymidine synthesis that plays a role in bacterial DNA synthesis. Put another way, by binding dihydrofolate reductase, trimethoprim leads to reduced bacterial folate synthesis. We learned above that trimethoprim is often administered alongside another folate antagonist, namely sulfamethoxazole. This helps to overcome the now pervasive challenge of bacterial resistance with trimethoprim. However, though sulfamethoxazole is also a folate antagonist, it inhibits folate synthesis along a different point than trimethoprim – resulting in a synergistic effect that transforms the medicine into a powerful, bactericidal combination. So, how does trimethoprim pharmacology impact the side effect and drug interaction profile? It’s to that question that we now turn. Hyperkalemia – due to antagonism at the epithelial sodium channel of the distal tubule. Megaloblastic anemia – due to reduced folic acid levels. Elevated creatinine concentrations – trimethoprim competes with creatinine for secretion into the renal tubule. This mosaic of side effects also impacts many of the clinical considerations that surround trimethoprim. That trimethoprim can only be administered via the oral route. It is usually dosed at 12-hour intervals at 200mg per dose. Because trimethoprim can cause hyperkalemia, patients should avoid drugs that elevate potassium levels – ACE inhibitors, angiotensin receptor blockers, calcineurin inhibitors (for example – ciclosporin), and potassium-sparing diuretics. That trimethoprim is classified as category C – with “risk not ruled out”. However, due to the mechanism of action – namely, folate antagonism – the drug should be avoided during the first trimester of pregnancy. Due to how trimethoprim is metabolised and eliminated, dosage reduction and caution is warranted in patients with hepatic or renal impairment. Other folate antagonists – such as methotrexate – increase the risk of adverse hematological effects. Trimethoprim should be avoided in patients with a known history of folate antagonism-induced megaloblastic anemia. Certain drugs – such as phenytoin – are known to increase folate metabolism. As above, this increases the likelihood of adverse hematological effects. Though bacterial resistance to trimethoprim is rising, the drug continues to play a useful and helpful therapeutic role in combatting urinary tract infections. It remains a popular choice among prescribers who appreciate its role in the clinical setting. 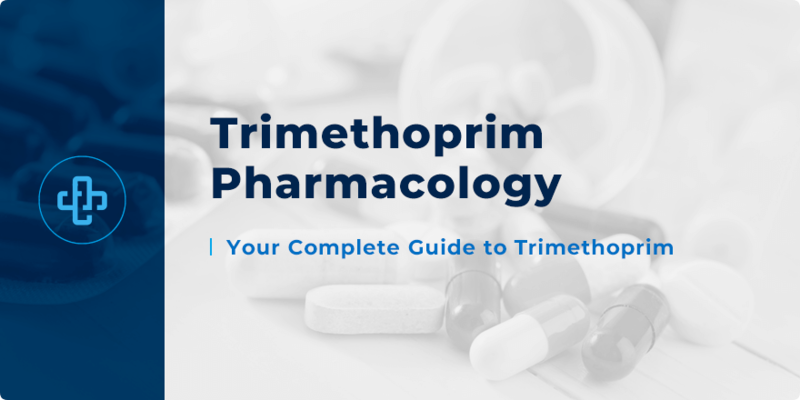 Want to test your knowledge of trimethoprim pharmacology? Register with PharmaFactz today to receive instant access to all the resources and quiz questions you need. In the meantime, take a few moments to join our newsletter (above) to receive all the latest information direct to your email!